Let’s get this out of the way, shall we? 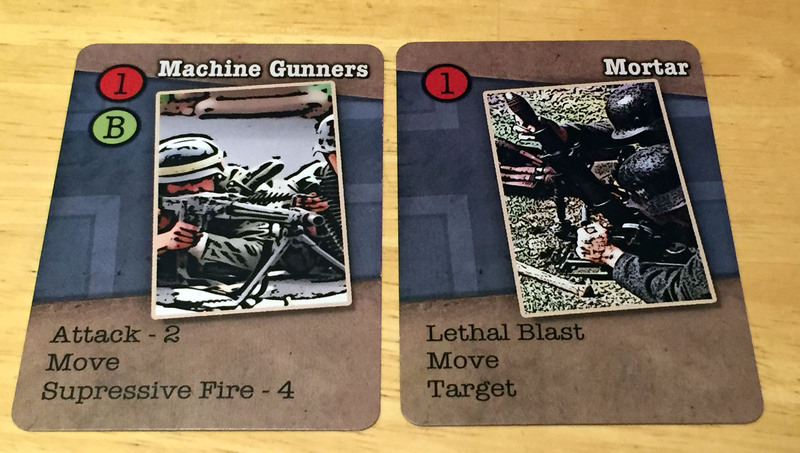 Lock ‘n Load Publishing’s forthcoming Platoon Command is not an attempt to reboot Up Front. It is neither Up Front 2.0 nor is it Up Front Lite. It is not Up Front Redux featuring behind-the-scenes footage of how a scoundrel and his shadow company absconded with more than 300,000 Kickstarter dollars and left a trail of litigation and rage. Not that I’m bitter, of course. No, courtesy of a rare bit of wisdom from corporate gameocracy, Up Front, or at least a reasonable facsimile thereof, is now available from the Wargame Vault and everyone interested can play this classic for a reasonable sum. Even more gratifying, the going rate for second-hand copies has now plummeted accordingly. And besides, Platoon Command, though a card-driven game of World War 2 squad-level combat, bears little resemblance to its far more complex, some have even dared to say obtuse, ancestor. By way of full disclosure, I’ve been involved in the playtest for the game since Origins this Summer and my remarks, and photographs, are based on the playtest version. Neither rules nor art should be taken as final. 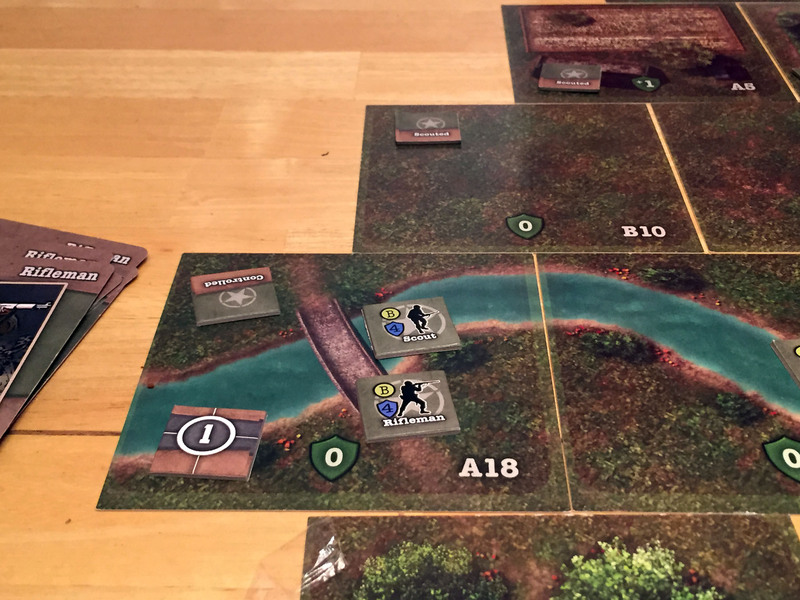 Platoon Command began life as a print-and-play game and, in the designer’s own words, as an attempt to meld a deck-building mechanic with the medium of a boardgame. On the deck-building side, each player begins with a small main deck, a far more ample supply deck, and a hand of four cards. Each turn one of the four hand cards is used to determine initiative while the other three drive play. As the game goes on, a player can draw more cards from the supply into his main deck by the play of cards. On the bad side of things, combat casualties result in unit cards being removed from play. If a unit ever runs out of cards, it is removed from the game. Also unpleasant are the fog of war cards that a player must place in his deck under certain conditions and which are intended to gum up his turn. On the boardgame side, the piece-count is extremely low. The basic unit is the scout or rifleman, both allocated in squads, with the former able to open up terrain for others to advance and the latter uniquely able to hold terrain once scouted. Machine gun teams also appear on-board. They can, rather than firing in combat, act in a suppression phase that can deprive the other team of actions. Mortar teams are lethal, but must be ranged in during a previous turn before they can fire. Yeah, so, “Lethal Blast” is bad, right? 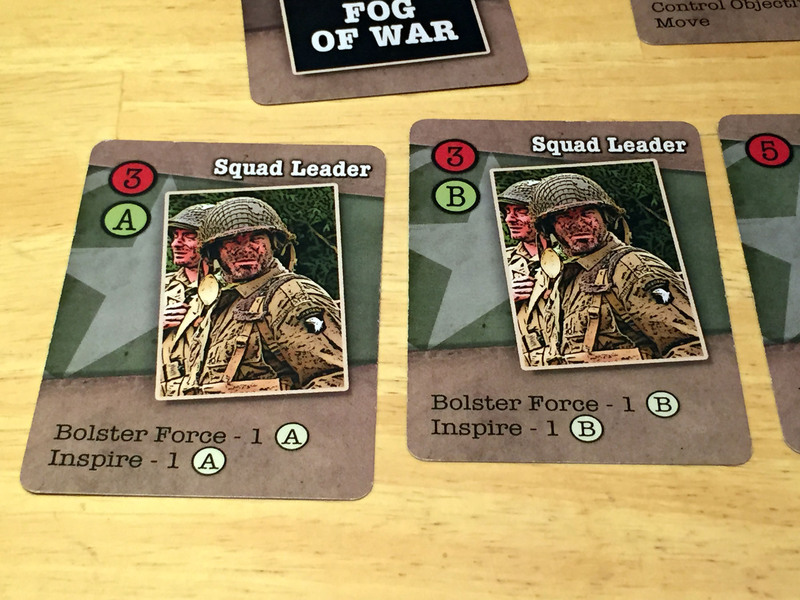 Off map are the vital leader units — both squad leaders and platoon sergeants. Squad leaders are represented only in card play, but they grant their squad members additional actions or, more vitally, bring in reserves to guard their squads against elimination. Platoon sergeants function much the same but can affect all squads, not just the ones to which they’re attached, and they can permit a player to bring additional cards from his main deck directly into play. Can the 82nd ever get noticed? Ever? I’m forever wanting to hide my men behind shrubbery or low walls only to remember they’re merely decorative. The board is custom built for each scenario out of a large set of nicely-drawn tiles. 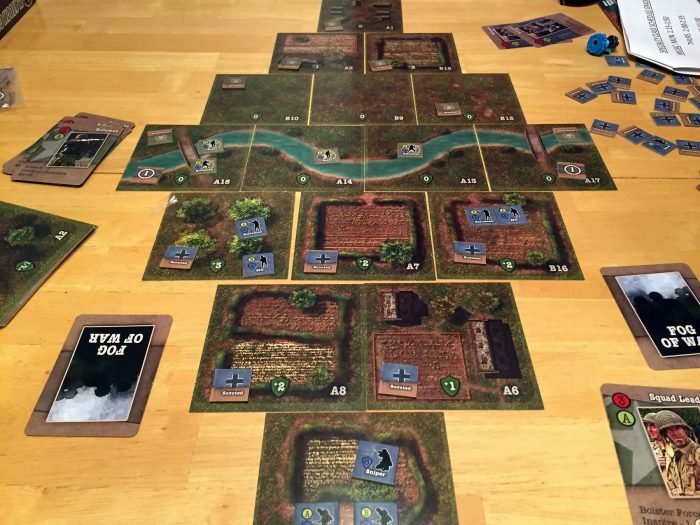 The game takes place in the familiar bocage of Normandy and the art evokes this well. Terrain is extremely abstract providing only a cover modifier to units within it. It does not modify movement or line of sight, something that takes a bit of getting used to for those of us familiar with the mad science of ASL or even, if one is being honest, Up Front. I’m forever wanting to hide my men behind shrubbery or low walls only to remember they’re merely decorative. Combat is also abstracted. Units are each assigned a defense value. This value, plus the number of tiles from the firer to the target, plus the terrain modifier mentioned above, gives the number that must be met or exceeded on (usually) a single d10 to score a hit. Each hit results in a card for that unit being removed permanently from the game. One thing that I’ve already noted to the design team is that this is a game that needs its many component parts working together to make it shine. While the rule book is prudently designed to introduce unit types and concepts one or two at a time, the game didn’t “click” for me until I had moved on to the more advanced scenarios and started to see the fun interplay between the cards, units, and terrain. A final note should be made that Platoon Command covers a piece of World War 2 that few other games have: the role of the National Guard. For all the deservedly-honored heroism of better-known units, it’s refreshing to see a game dedicated to the actions of the 30th Infantry Division as it took its part in the Normandy campaign. The well-illustrated scenario book follows the 30th from D-Day +4 and tells stories with which I was unfamiliar. That by itself is gratifying. 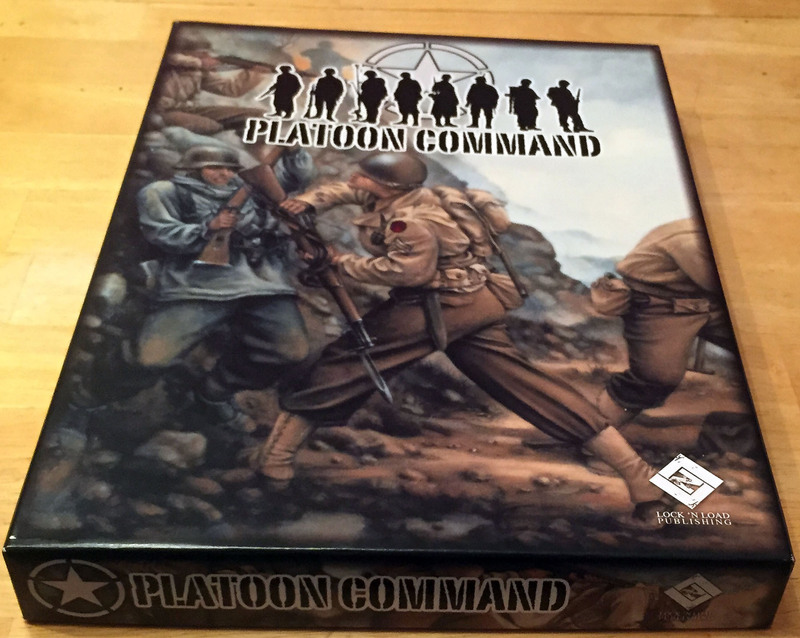 Lock ‘n Load plans to release Platoon Command in Spring of next year.